Real maple syrup can cost a fortune when you’re giving it to 5 kids on pancakes and waffles. Since homemade pancakes and waffles are easy breakfast to make in bulk, I’ve looked at other options for adding extra flavor to our favorite breakfast. Fruit sauce, especially homemade fruit sauce, is a lower cost option. When you make your own sauce, you can control the amount of organic sugar in the sauce and enhance the flavor with extras like vanilla extract. 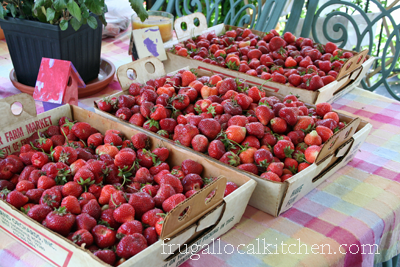 With strawberries in season, I can pick my own at a local orchard like Linvilla Orchards for $2.99/lb. Homegrown fruit is even cheaper. Otherwise, I’m paying $12 for 32 ounces of maple syrup at Costco or $17 to $24 for Grade B Maple Syrup on Amazon. You can use this recipe to make blueberry, raspberry or blackberry sauce. Or, mix up several kinds of berries to make your own one of a kind sauce. Vanilla, almond or orange extract can increase the richness of the sauce without adding sugar. Rinse and cut off the stems on the strawberries. Depending on the size of the strawberries, cut them into halves or quarters. Small strawberries can be used whole to add texture to your sauce. Put prepared strawberries into large heavy-bottomed pot, and put organic sugar on top. Turn heat onto medium low. Once the strawberry mixture begins producing liquid, turn heat up to medium. Add dissolved cornstarch and mix in. Bring to a boil and let boil for 1 to 2 minutes while mixture thickens. Continue stirring while boiling to prevent boiling over. Remove immediately from heat when finished and allow to cool before storing in the fridge or freezer. Can be used on gas and electric; not recommended on glass cooktops. Guide to canning, freezing, drying, picking food and so much more! Looks and sounds good, Barb! Thanks for sharing at the Healthy Tuesday hop! I just love a great fruit sauce and your recipe looks awesome! Thanks so much for sharing with Full Plate Thursday and have a great weekend. How delicious! I love strawberries and I love pancakes–what’s not to love! I would love it if you would share your post at out link party,too! 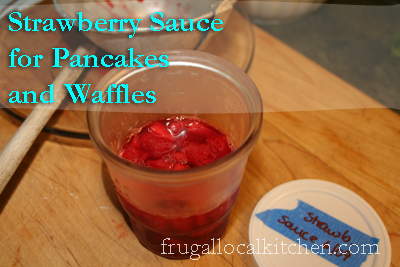 I just had breakfast but I could go for a waffle and some of this strawberry syrup! We go through maple syrup like water, and it is pricey! We will have to give this a try, we all love strawberries so I know it’s gonna be a hit! Oh, I hear you! DD8 loves to dump tons of maple syrup on her pancake. I finally told her I was doing the pouring. If I don’t, I grab the extra off her plate and save it for her next pancake. Sounds like a tasty sauce – fruit is good in any form in my mind, espeically summer fruits!